For last month’s Daring Kitchen Cooks’ Challenge, Lis and Audax Artifex (whose parents must be congratulated for giving him the best name on the planet) gave us a very technical challenge and dared us to make patties. 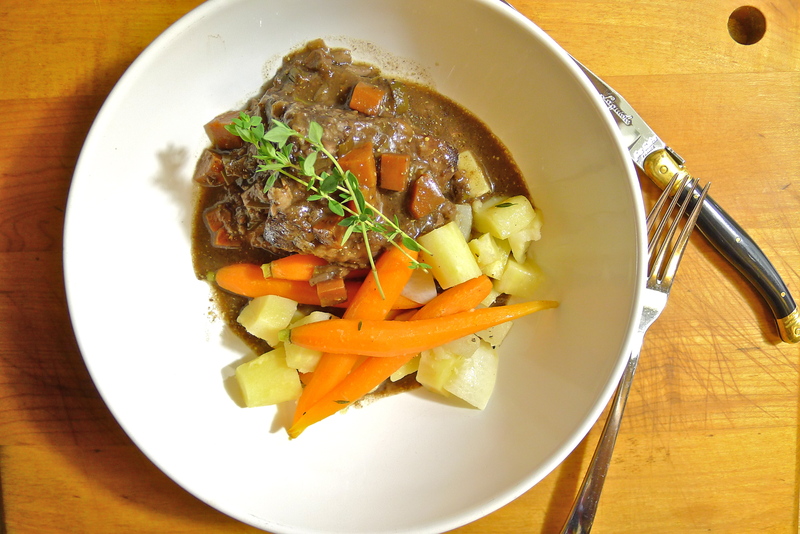 This month, Carol from Newfoundland, Canada, has given us another technical challenge: braising. When most people consider braising, they think of tougher cuts of meat that generally have a lot of muscle or connective tissue — think lamb shanks, oxtails, short ribs, or stew beef. Braising is a very easy way to cook these economical cuts of meat, transforming them into meals that are the embodiment of pure comfort and elemental nourishment. Braising can also be used for certain kinds of vegetables — carrots, celery and parsnips, for example — that take a long time to cook to mouthwatering tenderness. In Carol’s challenge PDF, she gave us several recipes for ideas, including one for braised short ribs from Michael Ruhlman. Ruhlman’s recipe jazzes up short ribs with a snazzy gremolata. However, whenever I think of braised short ribs, I think of the traditional French bonne femme: pure, simple, and uncomplicated . . .
. . . which is of course why I chose a recipe from Thomas Keller‘s Ad Hoc at Home cookbook — ha ha! there goes the uncomplicated bit! Reproduced in Food and Wine Magazine, this recipe from Keller and his brother Joseph is really quite simple. Though there seem to be like a lot of steps, they are all dead easy. The difficulty comes in just waiting to eat as your house fills with the wonderful smells of braised meat. The absolute most difficult thing is delaying gratification for a day, if you can, in order to be able to remove the fat rendered from the ribs and deepen the flavors of the braise. I can only say that though it is hard, waiting is not impossible so long as you chant like a mantra, “It will be better tomorrow, it will be better tomorrow”! A big thank you to Carol for the great challenge! I encourage everyone to take a look at her challenge PDF. She includes so many more ideas for braising (fennel, duck, pork belly and oxtail), and it is a great way to learn more about braising! 1. In a large saucepan or Dutch oven, bring the wine to boil over medium-high heat. Remove the wine from the heat and add the vegetables, the parsley, the thyme and the bay leaf. Cover the saucepan and let the marinade cool completely. 2. When the marinade has cooled, season the short ribs with salt and pepper and arrange them in a single layer in a large Zip-loc bag. You may want to double up the Zip-loc bags, just in case they leak. Pour the marinade over the ribs. Squeeze any air out of the bags and seal them. Let the ribs marinate in the refrigerator overnight, turning the bag over every once in a while to make sure that the ribs marinate evenly. 3. Preheat the oven to 300°. Remove the short ribs from the marinade. Strain the marinade, and reserve the liquid and the vegetables in separate bowls. In a large skillet, heat two tablespoons of vegetable oil until almost smoking. Dredge the ribs in flour, knocking off any excess, and add them to the skillet. Brown them over medium-high heat on all sides, about 4 minutes per side. Arrange them in a single layer in the bottom of a large Dutch oven. 4. Spoon off all but 1 tablespoon of fat. Add the strained vegetables and cook them until they begin to brown. Add them to the short ribs. Tip the reserved liquid to the skillet and bring it to a boil. Pour the hot liquid, along with the stock, over the ribs and the vegetables. Cover the pot with its lid and bake the ribs for about 3 hours. The meat should be very tender and almost falling off the bone. If proceeding to step 5a, leave the oven on. Turn the oven off if proceeding to step 5b. 5a. Transfer the meat to a large bowl. Skim off as much fat as you can from the surface of the cooking juices. Bring the liquid to boil over medium-high heat until it has reduced to about two cups of sauce. Whisk in two tablespoons of grainy mustard. Adjust the seasoning. Return the meat to the pot, cover, and bake for another 30 minutes. 5b. Braised short ribs are notorious having a deep layer of rendered fat floating on top of the braising liquid. If you can delay gratification for one day, let the ribs cool in their braising liquid overnight in the refrigerator. Remove and discard the layer of solidified fat from the top before preparing the ribs to be reheated. The beauty of this is that it easily allows you to get rid of all that fat. Secondly, as with all stews and braises, flavors meld together and become richer the longer the stew or the braise has to sit. So by waiting, not only will your braise not be swimming in grease, but it will have more depth of flavor. Good things come to those who wait! After removing the top layer of solidified fat, let the short ribs return to almost room temperature before preheating your oven to 300°. Scoop out the short ribs and transfer them to a large bowl as you finish the sauce. Set the Dutch oven with the braising liquid over medium-high heat. Reduce the liquid until you have about 2 cups of sauce. Whisk in two tablespoons of coarse mustard. Adjust the seasoning. Add the short ribs back to the sauce, cover the Dutch oven with its lid, and bake everything in the oven for about 30 minutes. 6. In the meanwhile, prepare your root vegetables. In a large deep-sided skillet, arrange the parsnips, the baby carrots and the turnips in an even layer. Add the chicken stock and the butter to the vegetables. Season with salt and pepper, and bring the liquid up to a lively simmer. Reduce the temperature to low and cover the skillet. Cook the vegetables until they are tender, about 15 minutes. Remove them from the braising liquid with a slotted spoon. Let the short ribs cool slightly before serving them with the braised vegetables. Its 8 in the morning but my mouth is watering anyway! The short ribs look wonderful. You will laugh if you read my post…we were really on the same wavelength with braising. Your brisket looks amazing! Lol! Something must be in the spring air to make people start thinking about braising! I think you are right…the temperature is still cool out. I’m glad you liked the looks of the brisket. Well, trixfred30 said it all! It’s 8 in the morning and I want to have this dish with my coffee. I bet the flavors are deep, rich, and bold. Yum. I’ve been craving parsnips for a few weeks. Now I can’t wait for the farmers market to open up in May. This post makes me more motivated to experiment with unusual cuts of meat like oxtails. Thanks! The flavors are amazing! I used half a loaf of crusty bread to mop up all the juices. Really, really yummy! I can’t wait for spring vegetables either. It has a been a while since our farmers markets had something other than apples and yarn! Oh wow, these look amazing! I have been wanting to make braised short ribs for forever! Thanks! Try it before it gets too hot! I know! I’m good with comfort food any time of the year too! Maybe it’s because my dad’s Southern . . .
Oh wow, I’m sure the effort of overnight marinating is worth it. Looks great! The cut called “short ribs” doesn’t really exist here in NZ, we must either cut it differently or call it something else. I always wanted to know what it was after seeing it used and refered to on Top Chef. You’re right though; it’s hard to get equivalent cuts from one country to another country. After falling hard off the vegetarian wagon in France, I had a look of puzzlement from supermarket butchers when I came back to the US. Things are much different now (there are actually a few French butchers and also Japanese butchers in town), but explaining certain things wasn’t very easy! “It’s probably far too late for this post to do any good, but so many of the answers were so very wrong…. While I can’t tell you the Imperial name for the cut, which very well might be “fore rib,” at least I can tell you what it is. A cow (or steer’s) rib cage is like a barrel — rounded ribs are attached to the back bone at one end, and (most) to the sternum (breast bone at the other. When the steer is cut in half the rib section is like half a barrel. The part nearest the back bone is the rib roast. Tangentially, the middle 6 ribs of the rib roast are the “prime rib.” The word prime has nothing to do with how the meat is graded. It simply means the best part of the rib roast or “joint” if you prefer. Continuing to move from the back bone to the sternum, we come to what’s called the “flank” both in the US and the UK. The fore ribs attached to the sternum, and the 3 ribs not attached to it, are the short rib. The primal to which they’re attached is called the “flank” both in the US and theUK. So, I suppose if you told the UK butcher you were looking for ribs from the flank (s)he could give you exactly what you wanted. The comparison to pork “spare ribs” was anatomically apt. “Baby back,” aka “loin” ribs are taken from what would be a pig’s rib roast, while spare ribs are taken from what would be the short rib. The part of the rib comprising short ribs is separated from the rib roast part with a saw. In other words, the rib cage is sawn in half cross-wise. If the flank ribs are then separated one from the other and sold as individual ribs, those ribs are termed “England” cut rib in the US. However if the butcher continues to saw across the ribs so there are several ribs connected by meat in each section, that’s a “flanken cut.” FWIW, flanken ribs are usually about 3/4″ thick.” And then there was a direct to a link from another poster with an image. The short bit that the butcher is sawing off would be our short ribs. I know 😉 Must. Answer. Questions. Cannot. Resist. The Google! I think talking to a butcher is probably the best way to go too. Even if you just talk about what you are trying to make, or the recipe, they should be able to help. Butchers are such an underutilized resource in this world! My dad is working as butcher’s these days. It’s a relatively new development (although he’s been cooking meat for over 20 years) and technically, I’m a butcher’s daughter. It’s certainly an untapped blessing. I’m just waiting for when he’s not so new at his job and can start to give me the sage advice that only a butcher can give to his children. Your dad is working as a butcher? That is amazing! What an incredible skill to learn. Good butchery is really an art. Yeah, I don’t know the details of it, but after he sold his shop (he was cooking), he was a little lost for a while but then started working at a butcher. He’s there 6 days a week so there must be some gems gleaned from him one day. This recipe is intense and with lots of ingredients. Lots of ingredients, but actually pretty easy to make. Just time consuming! Braised beef is so yummy! So easy too. You can just pop it in the oven and then go about your business. When you come back into the kitchen, wonderful dinner! Rice is a great pairing for all braises too. It’s my mom’s favorite combo! Thank you, Carol! It is such a compliment! I have to give the pork belly recipe in your PDF a whirl. Sounded absolutely delicious! And thank you again for the wonderful challenge. You were a wonderful host and I learned so much! I love Thomas Keller too! Admittedly, the F&W recipe simplified his ad hoc one a fair amount (the one in the book has you make a red wine reduction instead of a marinade, and then putting a layer of cheese cloth in-between the ribs and the vegetables so that they don’t touch, and then covering it with a parchment paper lid instead of a regular lid). I was pressed for time, so I opted for the F&W one! Which makes me think that Keller really should release two versions of each book: the Master Chef Unabridged version, and the Lazy Cook Abridged one! Like dictionaries!